"I delivered with Dr. Vivek, and she gave me the best care I could have asked for." "I was throughly impressed by Dr. Vivek and her entire staff." "Love the staff here at North Atlanta Women's Care. They are the best!" "Dr. Cook is the best! She is so knowledgeable and friendly!" "I highly recommend the incredible staff here at North Atlanta Women's Care!" "I highly recommend Dr.Vivek and North Atlanta Women’s Care." "Dr. Cook was so personable and made the experience very comfortable! Would recommend." "Dr. Cook was personable, knowledgeable and efficient with her time. 10/10!" "Dr. Cook is great! She explains things in an easy-to-understand way." When it comes to choosing an OB/GYN, you have a wealth of options. Having more choices means you have the ability to take time and find a provider and a practice that’s right for you. 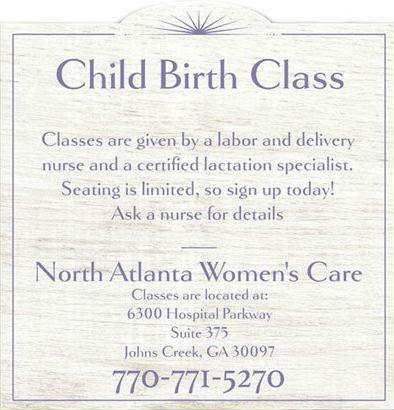 For many women in Johns Creek, Georgia and the greater Atlanta area, North Atlanta Women’s Care is the preferred source of comprehensive OB/GYN care. The practice offers a full range of women’s health services, from routine well-woman exams to family planning and STD testing. If you have a serious gynecologic issue, North Atlanta Women’s Care offers a team of specialists who can help. When the time comes to add to your family, you’ll be supported and cared for every step of the way. The physicians at North Atlanta Women’s Care bring a range of skills and experience to the practice. Dr. Sujatha Vivek and Dr. Whitney Cook are devoted to addressing the individual needs and demands of patients in a warm and caring environment. The all-women team of board-certified gynecologic and obstetric physicians are dedicated to helping women take charge of their reproductive health through education, diagnosis, treatment, and self-care. North Atlanta Women’s Care wouldn’t be such a special place without the amazing support team that facilitates your care. From the time you walk through the door until you schedule your next visit, you can rest assured that you’re in good hands. The practice has attracted some of the best nurses and administrative staff in the area, and all team members work together to make your visit as smooth as possible. Staying abreast of advancements in medical technology is a priority at North Atlanta Women’s Care. Team members routinely pursue additional training of the latest tools and techniques. Diagnostics and treatment are completed using state-of-the-art technology delivered with care. If you’re looking for an OB/GYN who is dedicated to keeping you at the center of every interaction, book a time to come in and meet the North Atlanta Women’s Care team. You may just become the newest member of the practice family! At North Atlanta Women’s Care, we are committed to being your partner in health care. With our years of experience, we are committed to providing the highest quality of patient care in a professional and comfortable environment. Offering a full range of obstetrics and gynecology services from your initial exam, to childbirth and through menopause and beyond, our goal is to offer patient-centered medical care based on mutual trust and communication. Classes will be given by an experienced labor and delivery nurse and a lactation specialist covering all aspects of pregnancy, labor, and breastfeeding. We accept most major insurance plans. Here is a short list of just some of the plans we accept. Please contact our office if you do not see your insurance provider listed below.